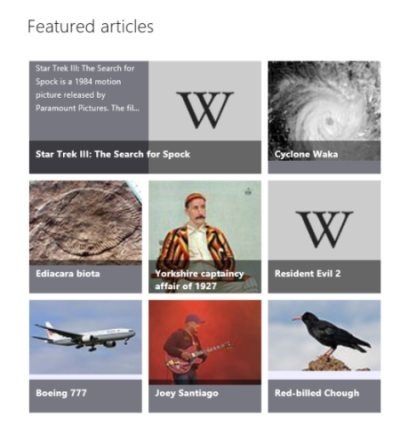 Wikipedia application for Windows 8 is a free downloadable version of Wikipedia to access articles from Wikipedia on your desktop. 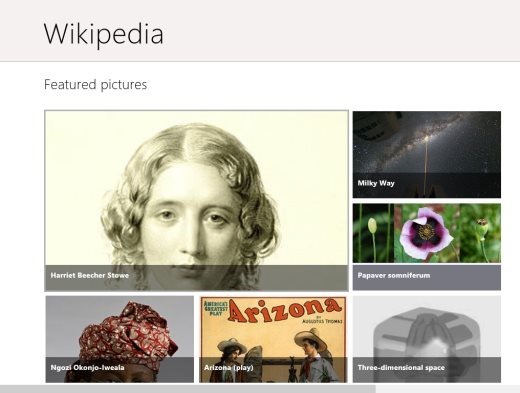 This Wikipedia application allows the users to read few featured articles present on this application. The interface is pretty cool with each article in a small tile form, so when you click on the tile, the article behind it opens up on the screen. This Wikipedia Application offers quite a good collection of articles under the category of Featured articles, Featured Pictures, and On this day. Within the On this day collection, you will find articles describing the importance of few important days with year. Wikipedia application even allows you to open any article in your browser with a single click on open in browser option which appears when you right click on the article. So in this way you can read any article present within this application on the browser as well. The good part of this Wikipedia application is that you can read articles in your preferred language by right clicking on the article and selecting “Read In” option which appears at the bottom of the interface. So you can read the featured articles in various languages like Chinese, Japanese, Belgium and more. You can even read these articles in few Indian languages like Punjabi, Marathi, Nepali, Malayalam and more. Don’t forget to check out our recent post on Quick Note App. Read the article on the web browser with a single click on Read in browser option. Enables you to select and read articles in your preferred language. Wikipedia Application is basically a desktop version of Wikipedia which you access online on your browser. Go ahead and try this application from Windows 8 App Store.